This is simply for reference, we are not responsible for anything you to do your own car. 1. Safely Jack up the side of the car where the work will be performed, and chock the front wheels to keep the car from rolling. a. 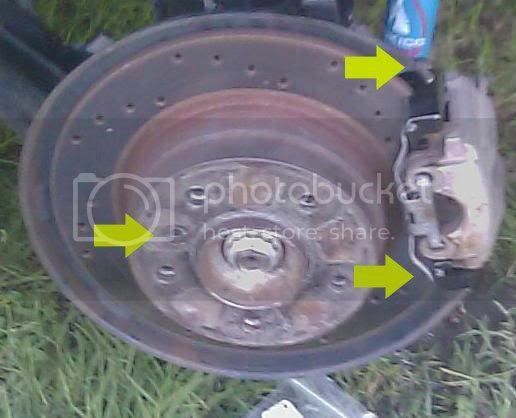 Remove lug bolts (17mm) and remove the wheel. 2. Remove the screw which secures the rotor to the hub (6mm) Allen socket. a. 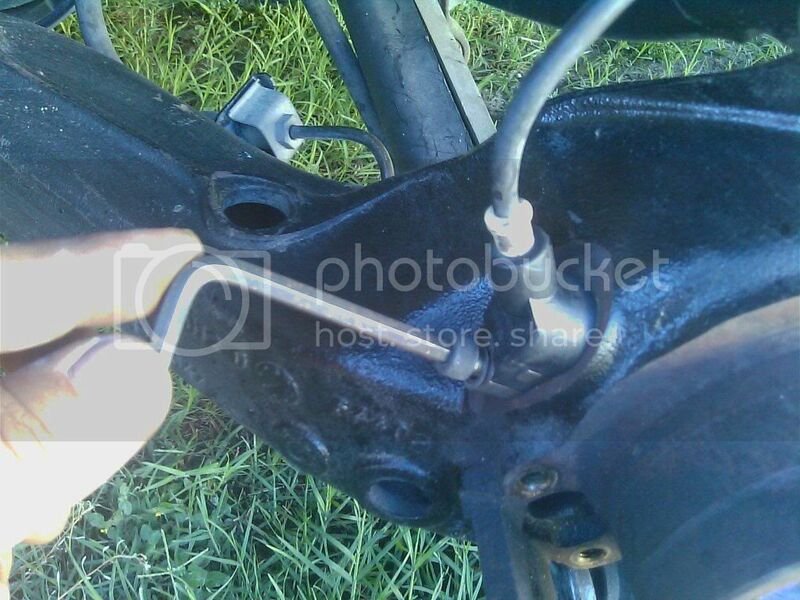 Remove the Caliper by loosening the 2 guide bolts with the (7mm) Allen socket. b. 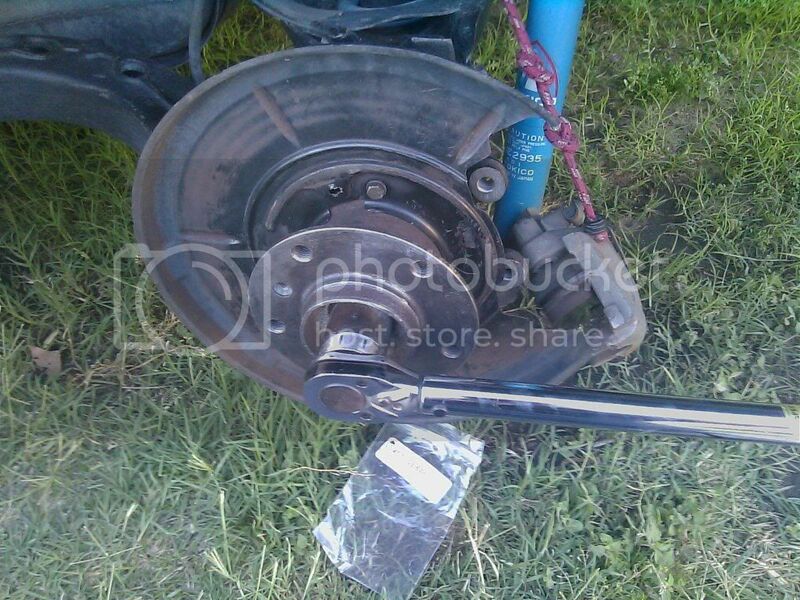 Next remove the 2 (15mm) bolts holding the caliper bracket to the trailing arm. 3. Bend the tabs back on the lock nut with a screwdriver a hammer may be required. a. Use the emergency brake or put the car in gear. This will keep the axles from rotating. 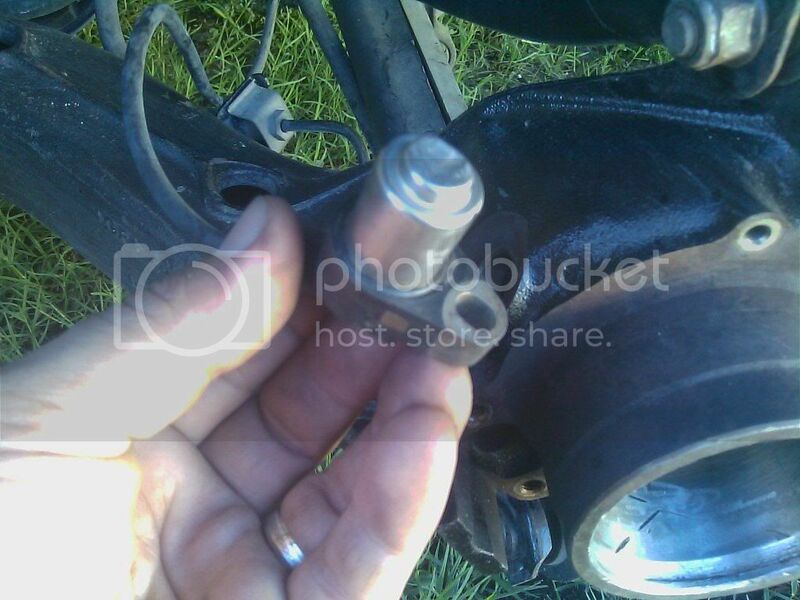 c. Now break out your (30mm ½) socket and breaker bar and remove the lock nut. 4. Removal of the hub should be pretty easy mine just fell out. If yours seems hard to pull out simply bust out the b90 tool and follow the provided documentation with the equipment. a. 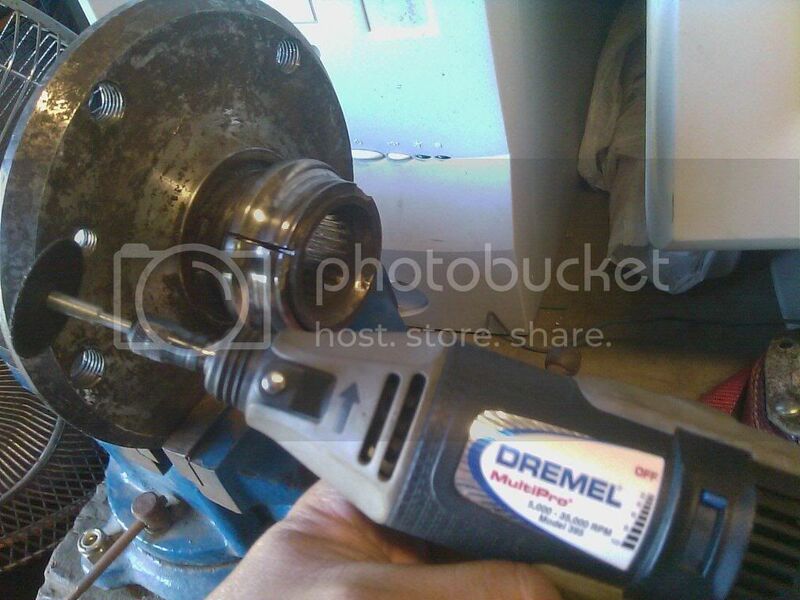 Removal of the inner race which is seized onto the Hub can be an easy job with the right tool the Dremel with a metal cutoff wheel is a good choice. This will relieve the tension from the inner race. A vice will keep it from moving while doing this. Don’t cut into the HUB! c. After a nice cut go ahead and take a nice sized screwdriver and a hammer give it a whack or 2 it should snap and break free. Be sure to clean up your Hub with a good cleaner to remove any old grease. 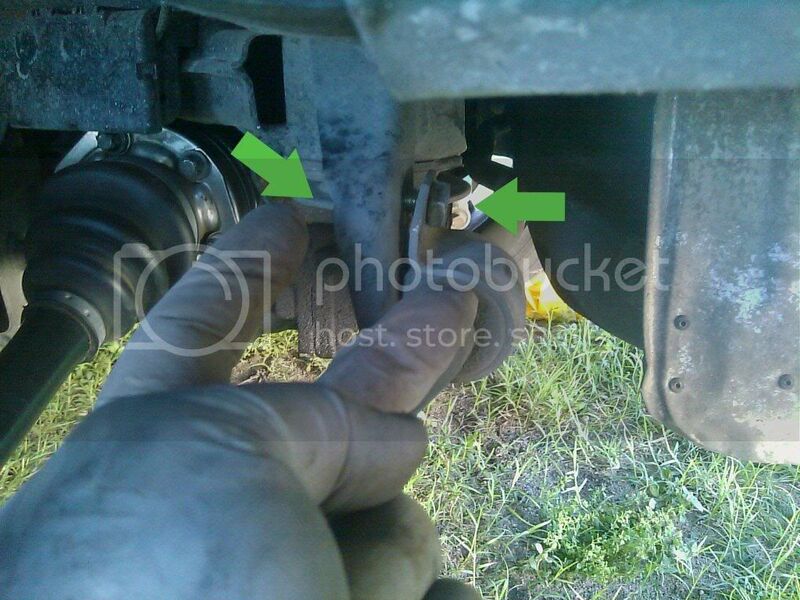 Axle removal: There are 2 ways of getting this out. b. Removing the exhaust. No $$ out of pocket maybe just a few %$^&* and a few more #$%^!!! c. I went with the Exhaust removal route because cursing was free. 6. 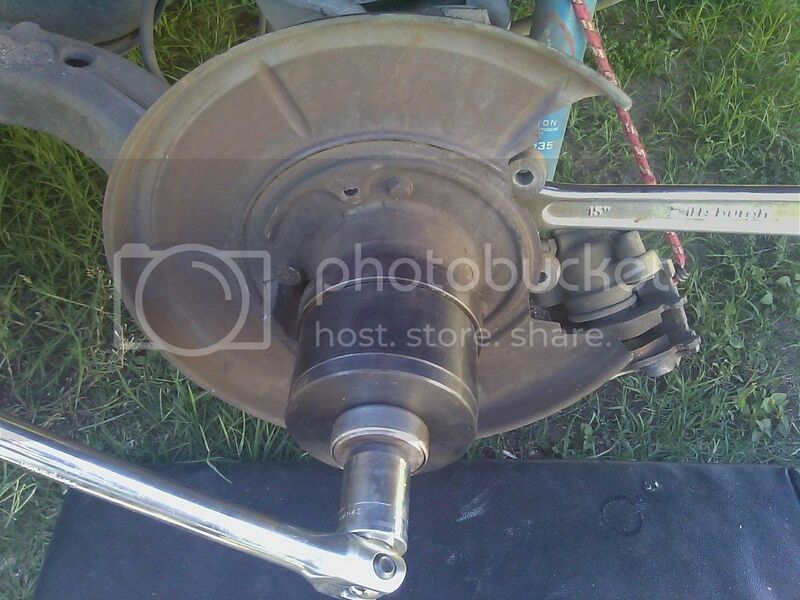 Support the underbelly of the exhaust with a jack or whatever useful. Remove the 4 exhaust bolts (13mm) and nuts (12mm). 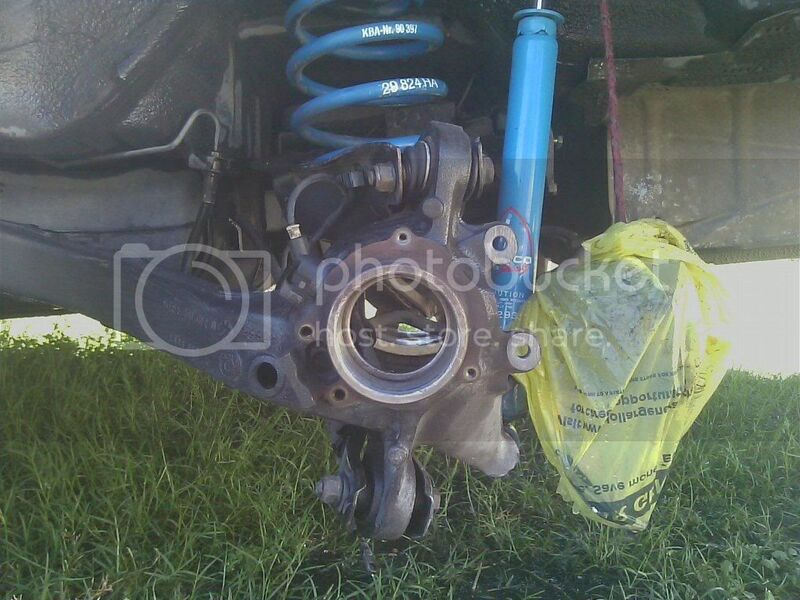 Now get the 2 (13mm) nuts at the hangers by the rear bumper and a few pulls should do it. 7. 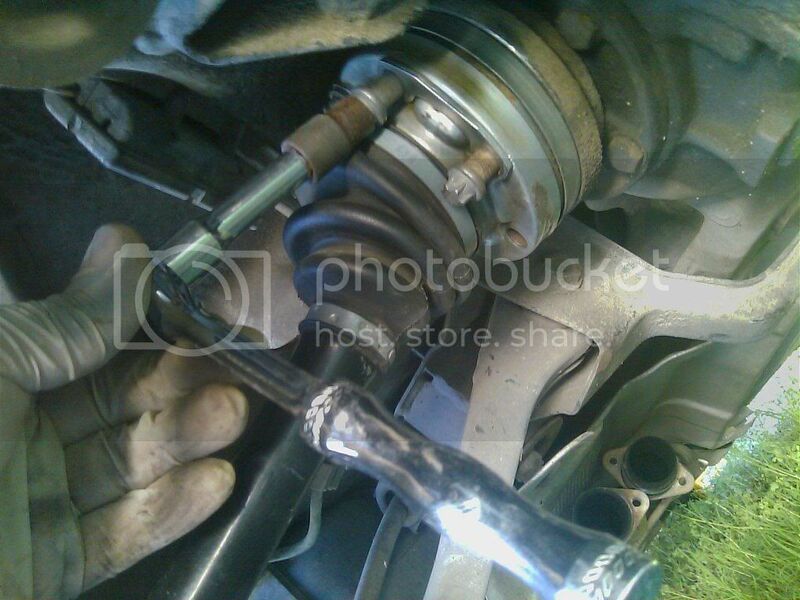 Now loosen the rear sway bar work side only! 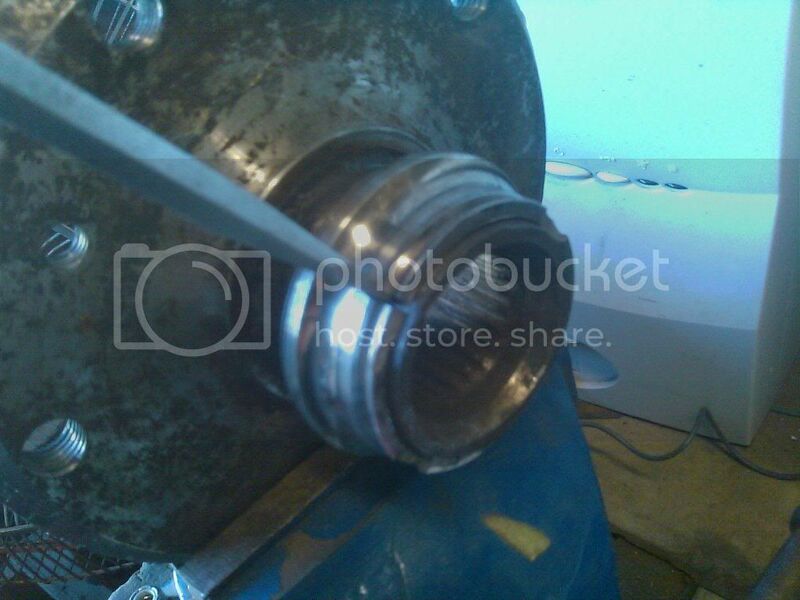 The first picture (a) shows the removal of the clamp there will be a bolt and a nut both (13mm). The second photo (b) shows the removal of only 1 nut sized at (13mm). Move this out of the way by pulling down. 8. Lock the axle by putting the car in gear or using the E-Brake. a. 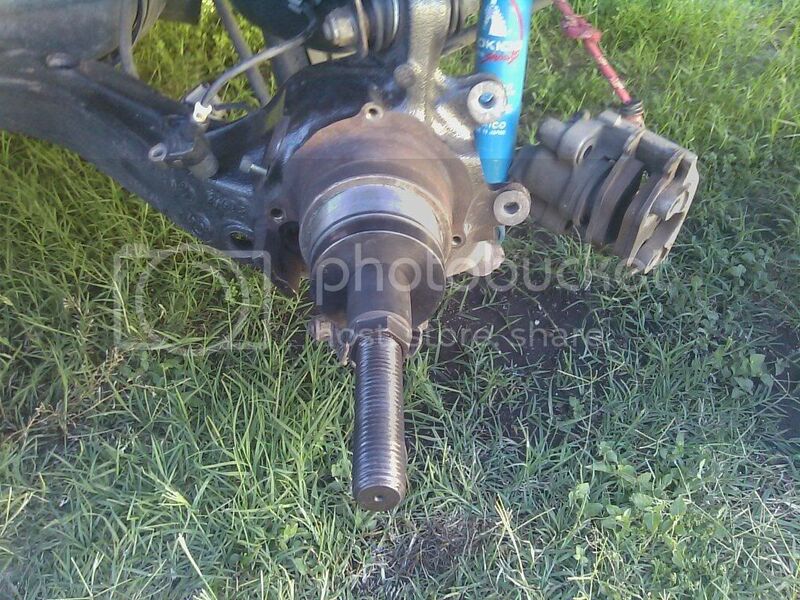 Remove the 6 Torx bolts holding the axle to the differential using E-Torx (external Torx) socket size #12. Remove the axle now would be a good time to clean up the Axle and ABS ring. c. After cleaning the Axle now would be a good time to make sure everything lines up as it should inspect the Axle shaft from any cracks or bends same goes for the hub. 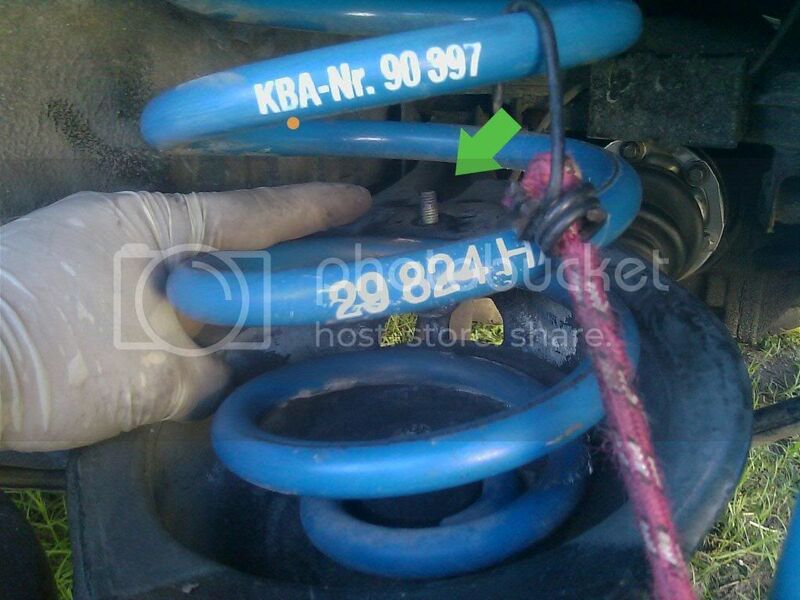 Now’s a good time to remove your e- brake setup springs and all. 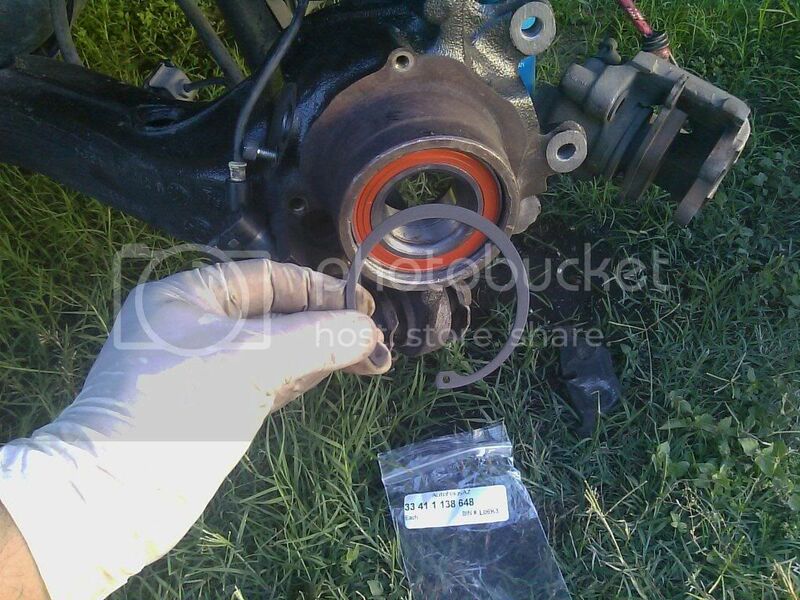 Get the Sir Tools B90 tool set and begin to extract the bearing from the axle housing. Be sure to grease up the threads this will make the extraction go much smoother. I used a 27mm socket with breaker bar and a really big crescent wrench since I didn’t have a wrench big enough. 10. Now is a good time to clean up the area if you choose to. I used a mild degreaser like fast orange and took a plastic bristled brush to it and rinsed off with water carful to dry off any water inside the bearing housing to prevent any rust while I let it dry off. Also take note I covered my calipers since I didn’t want to wet the pads which were still together with the caliper. 11. Be sure to clean the ABS sensor and remove it before installing the bearing as it should be damaged by the plate used during installation. 12. Get the new bearing out of the freezer and be sure not to pull out those inner races you do not want to do that it so be careful handing it. a. Begin by slightly sliding in the bearing making sure its strait and not cockeyed look at it at all angles if need be. c. Now setup the Sir Tool kit again and be sure it’s all lined up strait and begin the installation while the bearing is still cold. 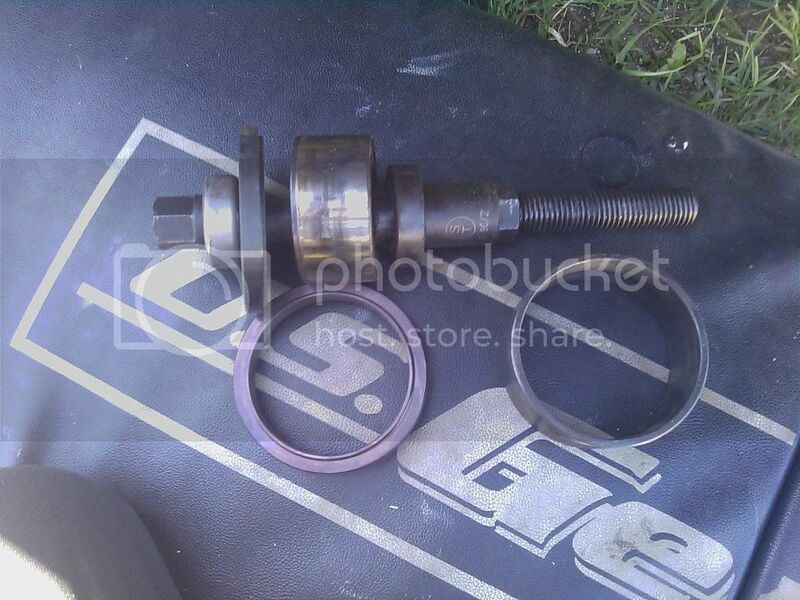 f. Now install the retainer ring to keep the bearing in place Pn: 33411138648. 13. Now you can reinstall the ABS Sensor (pictured in 11a) and torque it down hand tight will do. 14. Now it’s time to start putting everything back together. a. Install the Outer Hub And Press this bad boy in First!!! 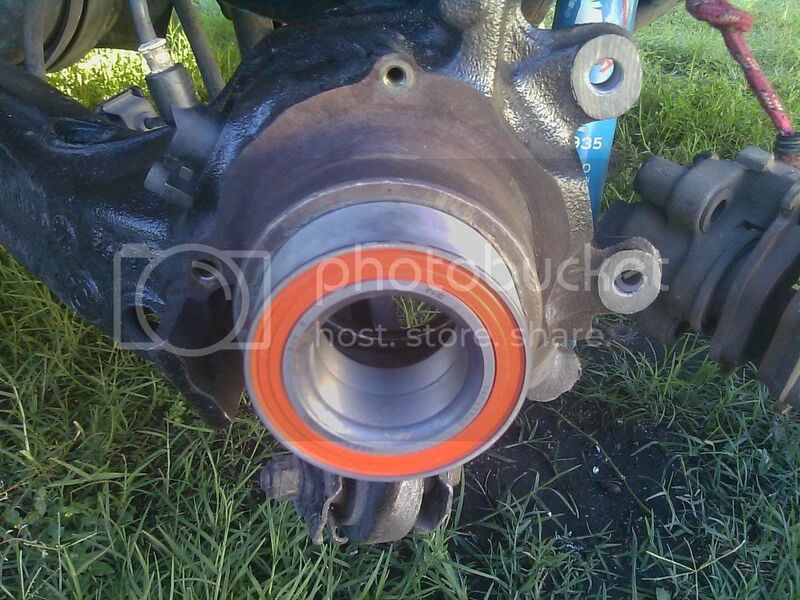 Be sure to line up the hub with the bearing so it’s perfectly straight. This will be sure you get the the right amount of threads when screwing the nut. And try not to knock out the inner race! handle with care!! 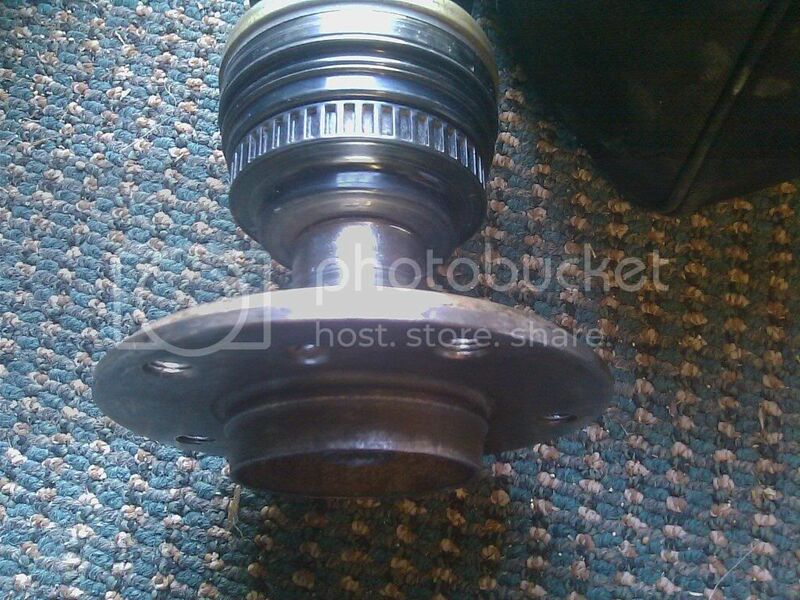 Once in go ahead install the Axle into the Hub and Bearing Race. Now get those E-Torx (12mm) and lock plates (pictured 8b) and torque down. Remember to put the car in car if you have to lock the Axles to keep them from rotating. 15. Now that the Axle is tight now is a good time to reconnect the sway bar and bolts (pictured 7a, 7b). 17. Now the nut is torque down to spec. 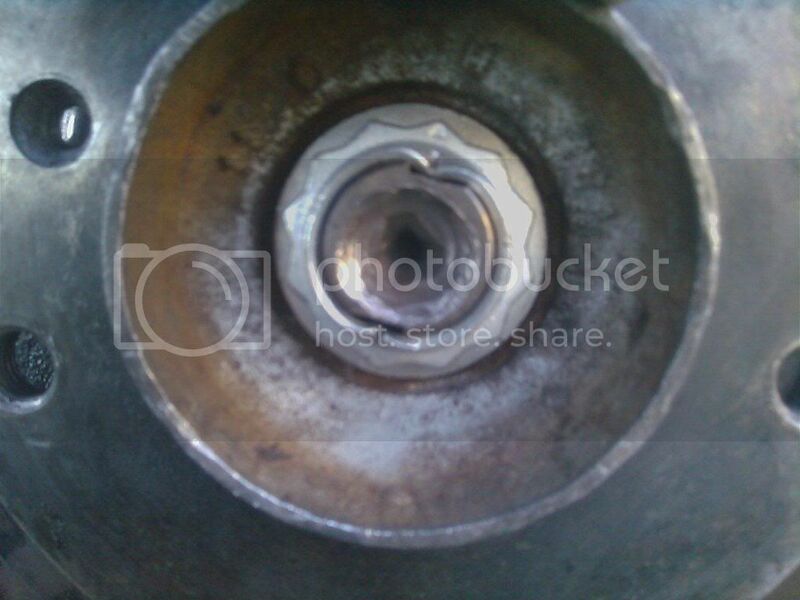 Grad a flathead screwdriver and knock the nut as pictured. This will keep it from coming loose. 18. Now begin putting everything back together. 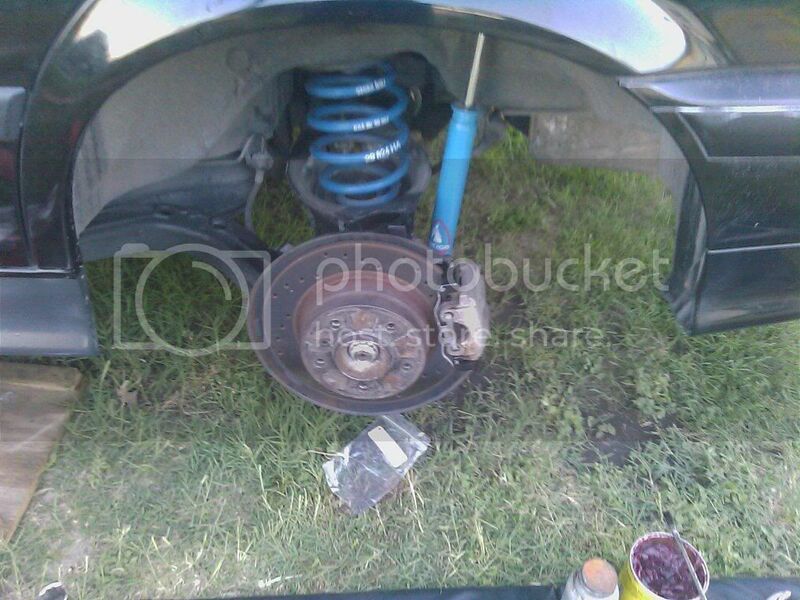 I started with the E- Brake and Calipers and finally the exhaust. 19. Congrats on your install!